Watchable drama enlivened by strong performances from both Glenn Close and Janet McTeer, though the story loses its way in the second half and fails to deliver the required emotional punch. Directed by Rodrigo Garcia, Albert Nobbs is based on the 1927 novella by George Moore and set in turn of the century Dublin. Glenn Close stars as Albert Nobbs, a waiter at an upmarket Dublin hotel who has worked there for many years without anybody guessing that he is secretly a she. When he's asked to share his room with visiting painter Hubert Page (Janet McTeer), Albert gets the shock of his life when Page reveals (in the film's best scene) that she is a woman too and also that she's happily married to another woman, with the pair living as man and wife. Inspired by Page's success, Albert pursues kindly hotel maid Helen (Mia Wasikowska), but things quickly become complicated when Helen takes up with greedy boilerman Joe (Aaron Johnson). This is something of a passion project for Close, who co-wrote and co-produced the film as well as starring in a 1982 theatre production in New York. As such, her performance is extremely impressive, even if she does occasionally resemble Robin Williams pulling a sad face. There's also terrific support from a scene stealing McTeer, while Wasikowska is superb as Helen and there's solid work from the likes of Brendan Gleeson, Pauline Collins and Mark Williams as the hotel's various other residents. Similarly, the attention to period detail is excellent and Garcia orchestrates some memorably weird scenes, most notably the two “men” going for a walk in the beach in women's clothes (they resemble a Little Britain sketch, except that there's a terrible sadness in the fact that both women are so comprehensively out of place and uncomfortable in women's clothes). The main problem is that the script never really foregrounds Nobbs, so our emotional reactions to his plight can only go so deep, especially as he keeps everything so tightly under wraps. Instead, the film loses focus as it switches its attention to Helen and Joe, which is frustrating in the extreme and not just because Aaron Johnson is a terrible actor. 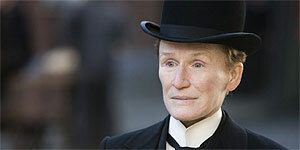 Albert Nobbs is entirely watchable thanks to strong performances from Glenn Close and a scene stealing Janet McTeer, but you can't help wishing the plot had more dramatic meat on its bones.